Winter is long and dark. Life is weighing you down. Cabin fever? Uninspired? Need some positive community time? 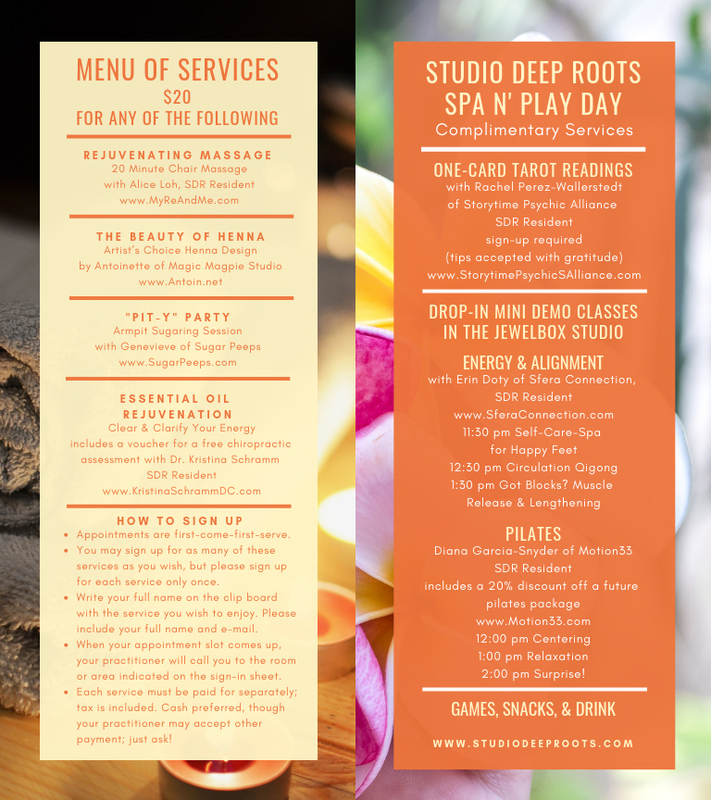 We’re offering an amazing mix of paid and FREE services and classes all afternoon (full menu of offerings at the event page)!Come to SPA N’ PLAY DAY at Studio Deep Roots. Show up, sign up, chill out! Come get sugaring, massage, henna, or tarot reading. Join a mini-class in Qigong, pilates, and more. Eat good food, sip a cool drink, play some games, and chill out. It’s gonna be an awesome time among our diverse community of dancers, healers, and artists. You don’t have to sign up for a single service to join us. Just come relax and hang out with a super rad group of human beings. We always have a good time, and we want you to be a part of it. We will open the doors right at 11am. If you have a dish or drink you brought to share, we’ll set up a table full of yummies to enjoy. There will be clipboards in the lounge with sign-up sheets for each service offered. You can sign up for any and all you wish (one per each service only, please). Grab a snack or a drink and head into the Warehouse chill-out space. Sit down and watch a movie, or just lounge around on the carpets and pillows and hang out until your name is called. Shay will have a small collection of casual board games to play and will gladly teach you any you want to learn and play while you’re waiting for your next service or class. When your name is called, your relaxation guide/practitioner will direct you were to go. Pay for your service (if there is a charge), and you’re good to go! For paid services, cash is preferred. $20 includes all taxes, so it’s the simplest option. Your practitioner may accept other payment methods, just ask! If you signed up for more than one service, and your name is called while you’re in another one, don’t worry! We’ll just jump to the next person on the list and come back to you when you’re free. So you’re free to sample any and all services you’re excited to try! Every 30 minutes there will be a FREE mini-demo class in the JewelBox–six DIFFERENT classes throughout the day. We’ll have a schedule posted, and we’ll let you know 5 minutes before they begin so you can head over there to join in. They are drop-in as you wish, so no need to sign up. If you wish to use a yoga mat for any of the classes, feel free to bring one, but they are not required. That’s it. Show Up-Sign Up-Chill Out. 11am-3pm this Saturday at Studio Deep Roots. We’re excited to see you there!